Many years ago when I first moved to the beach, I was standing with a local real estate agent when I spotted a dolphin swimming gracefully in the surf. I pointed this out to my agent, who nonchalantly glanced and made the kind of monotone sound people make when they’ve seen something a thousand times and aren’t paying attention. Incredulous, I asked him to stop what he was doing and look. I told him how my mom had loved dolphins and would have cried with joy if she were alive and standing with us. And then I vowed to pay attention — to not take for granted the beautiful miracles of nature. Recently I’ve been staying in a home in the mountains. I came to write a bit, to relax, to get away from the city. But it’s become home and we’re going to stay a while. Like the beach, the mountains have their own miracles: ancient redwoods, ponderosa pines, deer, turkeys, rabbits, quail and, even the occasional coyote. In keeping with the promise I made standing on the shore that day, I feel a deep sense of gratitude when these animals visit. At times my wife and I sit, watching the deer as the sun rises, their dark silhouettes becoming visible against the burnt-orange background of the morning sky. My friend John Tarrant once said, “Attention is the most basic form of love.” This is true for our human relations and with nature too; we love the animals and trees through our quiet presence and attention. 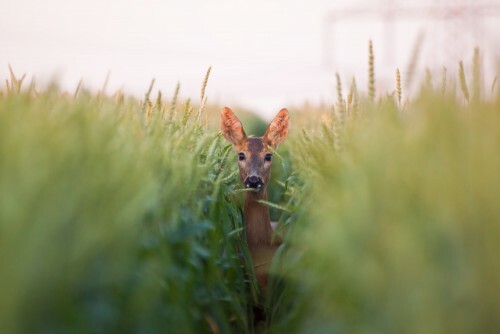 Amongst the wildlife that shares our land is a solitary deer that allows herself to be seen only when she emerges from the safety of the brush and moves skittishly from one place to another searching for food and water. Unlike the graceful movements of the other visiting deer, she moves with a limp and a hitch, the way Kevin Spacey’s character walked in The Usual Suspects. By all accounts she appears to have been injured and left behind by the other deer to fend for herself … slow and cumbersome, a liability to the others. Whenever I see this deer my heart wants to help her. I find myself thinking of ways to give her food and shelter. Sometimes I even find myself wishing I could comfort her with a hug. As Guru Singh taught me to see myself in other people, I have found myself in the little deer with a limp and no friends. I’ve wondered at times if perhaps I have it all wrong. Maybe the deer is grumpy or antisocial and chooses not to be around the other, happy deer. Maybe she has more in common with Kevin’s Spacey’s evil Keyser Söze than a bad leg. But of course being grumpy and alone is no different than being injured and alone … they’re just two expressions of loneliness. I often write from a place of loneliness. Not that I’m lonely right now … I’m surrounded by so much love. But we all have themes that play in our heads, familiar stories that, like those songs you don’t really like, get stuck on repeat in your mind. Like Achy Breaky Heart or Ice Ice Baby — you don’t choose them, they just seem to be there… playing (perhaps taunting you) in the background of your mind. My story of loneliness was an inheritance from my Grandma June. She learned it while sitting alone on the floor of an orphanage in rural Minnesota after the death of her mom and her subsequent removal from her alcoholic dad, who mourned the loss of his wife with a bottle of whiskey and a wooden stool in the local bar and forgot that his kids were all alone at home. Later in life, Grandma taught the story to my mom. Afraid to hold her baby daughter … worried she would break her in some way … afraid of losing someone else she loved, Grandma June — a woman who had learned to fear the connection of motherly love — neglected my mom as she loved her silently, from afar. By the time I was born, the story — which took my grandma and mom by surprise — had a head of steam and a full tank of gas. Genetics caught up with me, and you might say I was made to ride the story that had driven my family scenario for generations. It manifested itself in a gnawing sensation deep inside that I wasn’t quite good enough, lacking in some way, in need of some heroic effort to prove myself. So — like Peter Parker and Clark Kent — I found a cape and an alter ego and became a succession of successes: straight-A student, entrepreneur, concert promoter, public company executive, and (even now) author … obsessively trying to overcome and quiet the story of my family. I read an article about Taylor Swift the other day and how she reacted after “losing” the Grammy award last year. She said the experience caused her to realize that perhaps her album wasn’t the best. It motivated her to return to the studio, ignore the people around her, and make a new album that would show the world. Her description of the lonely march of perfection reminded me of my life — working obsessively, seeking external validation, and when I stumbled ever-so-slightly, taking the world on my shoulders, alone, and finding a way to win. Lonely. Loneliness is a tricky thing, its cure is rarely found in accomplishments, people, or things. We may start out thinking those “cures” work as we surround ourselves with friends and possessions. In the beginning, it seems to help. I bought a big house and filled the house with stuff and threw parties for people who liked the stuff and the parties. It all looked good, like — what a happy guy! But underneath it all was the familiar smell of loneliness. This plot line is the inspiration for many Hollywood movies, the kind that nearly always end with the main character sitting alone watching other people enjoy his stuff while he endures his loneliness. That was me … in so many ways living the dream and yet always feeling isolated and alone. Self-help books tell us to let go of the loneliness, look around ourselves, and focus on the beauty. That’s cool, good advice … I guess. This kind of advice tends to come from the mind, intellectually wrangling an issue and dispensing words that are technically correct but lacking in the kind of real-world sensibility necessary to actually be helpful. The way politicians comment on unemployment by saying, “we need to create more jobs,” but then don’t actually give anyone a job. Like the lonely deer limping along the tree line of the forest, we need more than rhetoric to make it through the winter. So how do we cure loneliness? The answer is one that wouldn’t get me elected to public office, but I’ve found it to be true nonetheless. We don’t … at least not in the way that implies pushing it away and making it stop. Our loneliness is the product of a scared and abandoned voice inside, and our attempts to quiet or push away the voice only result in more abandonment and more fear, causing the voice to grow louder and more resolute. Like my Grandma June on the orphanage floor struggling to hold it all together, we, all of us, need a hug, to be understood and accepted as we are. The cure to loneliness is to listen to the loneliness and to be there for ourselves in a way that no one else can. We don’t overcome loneliness, we learn to embrace it. In the arms of self-love, loneliness slowly loosens its grip, and we realize that we’re not alone. This is the magic of meditation … its purpose beyond all the benefits we read about in business magazines and scientific journals. In life we validate the moments that are important to us by showing up and paying attention. In this way, meditation validates our own importance as we show up and (often for the first time) pay attention to ourselves. In meditation we take a pause from all the external action, we sit silently with ourselves and learn to love what we encounter in the silence. We look beyond the loneliness, find the injured doe trembling inside, and hold ourselves, tenderly, with nurturing acceptance. We admit we’re afraid, that we don’t have all the answers, and that we don’t want to carry the load all alone; in doing so we realize and understand that we just want to be loved. Paradoxically, we move beyond loneliness by inviting it to the party with all the other visiting emotions, and getting to know it so intimately we learn to love it … and ourselves. Meditation is how, in the midst of the chaos of life, we say “I love you” to ourselves. This week I invite you to show up for yourself. To pay attention to you. Notice the beauty in yourself the way you would admire a graceful dolphin in the ocean or a majestic buck in woods. Take a moment to sit with your loneliness, your fear, and your insecurity — befriend them. Create within yourself the safety of self-reflection, authenticity, and self-love. Find a quiet place, sit for a while, breathe, and be truly present to you. We all have an innate desire to be appreciated and accepted. Showing up for ourselves is how, in the midst of the chaos of life, we say “I love you” … give yourself that gift this week, again and again. Hey Jason-I trust this appreciation for your wisdom reply, encourages you to continue to share your sincere messages. I first learned about you when I listened to your interview with Rich Roll. I recently finished your book and have been enriched by your blogs. Please know that by you sharing your life experiences, I have started to slow down my chase for happiness in places other then from within. Thank you for your honesty. Be well. Thank you Jason…thank you. Your writing always seems to touch a part of me that I may have forgotten about or choose not to deal with. And, you make me feel like, it’s all okay. See Tom Brown Jr’s, “Grandfather” and read about his anecdote to loneliness–to become your own best friend. I think you would like Tom Brown’s books. One more example of you sharing how to hug ourselves. We had to put our beloved cat down this week it was so traumatic for my wife and I that we had to ask a friend to tags her to the vet. As Shakespeare said ” parting is such sweet sorrow.” That day was a lonely day because as crazy as this sounds our cat could talk to us she really could and she really did. When we got our Bernese Mountain dogs as puppies our cat defended herself one day and scratched out our puppies eye. So everyday of that puppies life we had to watch how she went thru his daily life wounded and lonely. Why do I read your boys and cry these tears of inner deep joy “connective tissue of memories” so embedded I the inner walls where the light switch location is only known by our touch. I will listen tonight to the audio version. Seems we are all wounded like the deer my loneliness allows me to find the real little boy in Joe who loves to hide but now knows that God provided paths we just need to read the road signs provided. Great perspective on being alone, not being lonely, or one can be lonely even if with a crowd of people. Does depend upon previous ‘stories’ (as you explained) or on one’s perspective. As an only child, spent many hours alone and able to be content with reading, biking, playing piano, creating, writing poems, loving our dog of about 8 years, listening to music for hours as a teen. Had friends, not siblings, so related (I believe) differently than non-only children do to friends. Still believe I do. As a senior, retired former nurse, have now spent many hours writing both prose and poems, doing art, photography, biking – all those activities I did as a child. Interestingly full circle and grateful to be able to enjoy such hours. If in a group, enjoy that too but it’s not a necessity in my life anymore to be that ‘social organizer’ for dinner parties, etc., as I was often in the past years. Yesterday, out walking in Vancouver, came upon a pond with ducks. I have always found ducks to be silly creatures with their quacking and wiggling their bottoms – the latter for what reason, I cannot figure, but it makes me laugh. I stopped to watch them all for about 5 minutes. Wondered if they ever get tired of being ducks, paddling in water or waddling on the land which always looks awkward. Mainly, ducks have always entertained me in a way even human entertainers cannot. My little bubble of joy from watching them is unique and one I recognize as a gift to me from them, without their awareness. How great is that a few minutes watching these small creatures can provide a sense of amusement but also connectedness with nature; a creature of nature. It does remove any sense of loneliness, a definite fact. Appreciated your words very much. Thank you. Jason, you really hit the nail on the head with this. Really made me think about loneliness in a new way. Thanks for your wonderful words. Once again, thank you for validating the voice of my heart. So many feel that loneliness is a thing to quickly get out of. Who wants to face all that darkness and discomfort, right? I have experienced of the beauty of loneliness. I see it as a sign that it’s time to rest and listen to those scared parts within me. They aren’t there to harm me and ruin my life. All they crave is attention, validation and love. Meditating in a way that grounds me in the present moment is the best way to embrace my loneliness. I am amazed how easily loneliness dissolves as soon as those scared parts of me feel safe and believe all is well. Just enjoyed your discussion and my Sunday morning coffee with me,myself and I just got much more powerful! Thank you! Beautiful. You write from the heart, Jason, and this reflection on family memories really touched me. I have learned to live with my loneliness, and no longer see it as a painful thing. I’m alone in life by choice, now living near and caring for my elderly parents, both struggling with Alzheimer’s. Sometimes the perspective of other people’s pain helps me cradle and share my own; it’s all relative. I crave alone time (by which I mean alone in nature, which is certainly not alone, but without humans, more accurately) and yet too much time alone makes me anxious. Oh, for that happy balance! Amazing writing. Even though I haven’t experienced allot of what you said but I can relate to that. This touched such a nerve. In the best way. Thank you for getting your truth out onto the interwebs. Painfully and beautifully relatable. I wanted to read this particular passage, because my cousin recently lost her cat, and she said that he was her best friend….and now that she doesn’t have him anymore, she feels alone. I could feel her pain, because i knew how much he meant to her. I’ve been trying to help her cope with it, because of what I’ve been through recently. I find it to be a struggle, but I feel better that I’m able to help her because of what I’ve been through. You are so right about the self-love…..there definitely needs to be more of that! I will try to show up for myself this week! Now: How am I going to stop it? Thank you for stumbling over your twitter feed and then finding out about your writings, they are very helpful in these times of trouble of mine right now! This world in being is a cure to loneliness,if and when this is understood,seeped in one’s own being,one understands, one perceives how and why all alone unity lives n enjoys diversity in being.